Huapangos Huasteco: Xochipitzahuatl - Santa Maria de Guadalupe (no vocals just music). El Canario, Que me entierren con huapangos, La Malagueña, El Hidalguense y Sierra Hidalguense, Las Tres Huastecas. Cielito Lindo. Can they play huapangos huastecos? Arriving on the music scene in the late 19th century, Mariachi Bands brought an upbeat yet traditional sound to Mexican culture. With a blend of guitars, violins, trumpets, the guitarron, and the vihuela, Mariachi music can truly liven up a party! The upbeat authentic Mexican folk music is the perfect accompaniment for wedding receptions, Cinco de Mayo parties, and so much more. 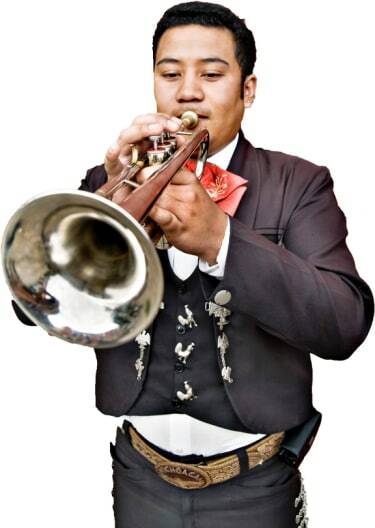 Search for Mariachi Bands in Santa Ana, California above. Please note that these Mariachi Bands may also travel to Villa Park, Santa Ana Heights, Midway City, East Irvine, Atwood, Corona Del Mar, Newport Coast, Laguna Woods, Sunset Beach, Foothill Ranch, La Palma, Los Alamitos, Silverado, El Toro, Surfside, Rossmoor, Seal Beach, Laguna Hills, Hawaiian Gardens, Artesia, Aliso Viejo, Laguna Beach, La Habra Heights, Rowland Heights, Trabuco Canyon, Las Flores, Signal Hill, Ladera Ranch, Walnut, and Santa Fe Springs.